Even in situations where there is clear abuse and neglect on the part of the mother, a father, many times, has an uphill battle to protect their children and get more than just visitation. Unfortunately, I have had to fight that battle with my own precious little boy. Below the story of what happened with me and my son. I hope that others will have the courage to fight for father's rights and push for equality within the judicial system in Texas and the rest of America. It should not have taken me a year and a half and over 50k to fight for even half time with my son who faced so much abuse and neglect. Please donate if you can as I have a mountain of legal fees I am still facing. Thanks! Baby Michael has been the victim of abuse and neglect, both physical and emotional. Michael was abandoned, crying in cars in parking lots while his mother was having an affair in a different vehicle. He has been denied medical care to the point where the police had to be called on his mother by the medical staff. Michael's mother is violent with baby Michael and his father. Michael's mother, Courtney Hudson, has admitted to much of this, including leaving Michael in cars and not thinking there is anything wrong with it. 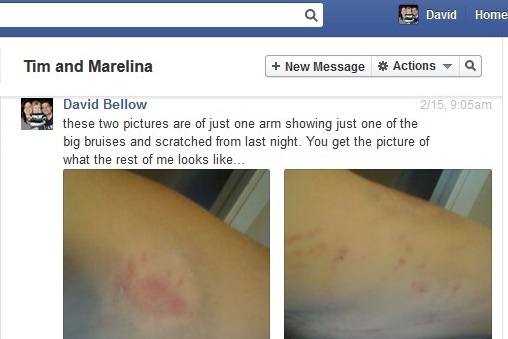 Below I have posted pictures/videos below of bruises and burns and other documents/information. Michael's father is fighting to protect him.Michael’s father, David Bellow, is at a disadvantage though since there is still an injustice, in not only the judicial system when it comes to a father gaining custody of a child even when they are clearly the more reliable, stable, and secure parent, but in our society as well when it comes to a husband being abused by his wife. Michael’s father is hoping to overcome these inequalities in our culture to keep his son safe but he needs your help. Michael’s father, as any good parent, could never live with himself if, God forbid, something did happen resulting in injury or death to his son, and he had not done everything in his power to protect him. Therefore, he is reaching out to you to bring awareness to what is going so people will not only know how to pray, but to also raise funds in order to legally secure the safety of his child in regards to custody (decision making). Michael's mother just cannot grasp the danger she puts Michael in, nor can she understand the consequences. She readily puts her own desires above Michael's basic needs. She even refuses to put shoes on Michael at exchanges in cold weather, even though the father provides shoes for him to wear, because her desire to remain mad at the father (for no real reason) comes before her own son’s need for warmth. She admits in her own testimony to leaving one year old Michael alone in cars and she doesn't understand what is wrong with it. She needs help. She has been diagnosed with one psychological disorder that we know of, but she refuses to get help. Baby Michael needs both a mother and a father. The father is certainly not trying to take a child away from his mother. He still wants Michael to spend as much time with his mother as he does. At the same time though, Michael's mother is incapable of making decisions (which is what custody would grant) that are in Michael’s best interest (and not her own). She has hurt him and will hurt him again. Michael needs to be safe from harm in a stable, non-violent home. Baby Michael's father provides that home and environment. Please help so the father can pay the legal fees needed to protect him and of course, please pray. That almost goes without saying but prayer is the most crucial need in any circumstance so it should be emphasized. Especially since, there is a double standard that Michael's father has to fight. If the roles here were reversed, Michael's father would be in jail and there would be no question about custody. But because Michael's father is a guy, it is an uphill battle to protect Michael and keep him safe, sadly, from his own mother. That, unfortunately, is the hard truth, and it does no good to her or to their child to deny or hide that fact as hard as it may be to accept. Right now, when Michael is with his mother, Michael's grandmother drives over from Houston to help his mother with her decisions. Initially, when Michael’s mother was on her own she would forget about pick-ups and drop offs so the grandmother drives her daughter to nearly every drop off and pick up. As soon as the custody trial is over though, her mother will likely stop keeping such a close eye on her and that is when the danger to Michael significantly increases because then there will be no one there to help Michael when is mother makes rash and violent decisions regarding his well-being putting him in harm’s way as she has done several times before. Some things you just don't talk about. This is one of them. Embarrassment, fear of ridicule, keeping personal matters private, etc. I have kept quiet about the abuse and neglect since my wife left me and filed for divorce over a year and a half ago. Many friends and relatives do not even know everything that is going on and I probably would have never reached out like this except that now, I need help to be able to protect my son. I am fighting to protect my son from neglect and abuse we both have been going through. I have already spent and borrowed over $40,000 for attorney fees and I just have no more loan or credit options before my custody trial. And I cannot liquidate the few assets I have left (so no selling of even things I owned before we were married) since all material possessions are still frozen over year and a half later after she filed for divorce. This is due to the fact that my wife and her attorney refuse to settle inventory before trial even though I have already given all of the items she initially requested and have even agreed to give her everything else she decided she wanted since then which is more than half. I'll never forget the screaming, crying and red face my little one year old baby Michael had when I found him alone in a car in Ritter Lumber Parking Lot in Beaumont, TX. He had been abandoned in the car for a good while by the time I showed up and took him out. My wife was having an affair in a different vehicle, and she didn't even know I was there until I knocked on the window of the truck she was in sitting on another man's lap and kissing him, the radio blaring which drowned out the noise of little Michael weeping in the other car. Baby Michael could have been dead, kidnapped, choking, etc., and she would have never known. Come to find out, my wife admitted in testimony that she left him in cars regularly to meet another man, not just this instance, and she doesn't seem to even grasp that it was wrong. 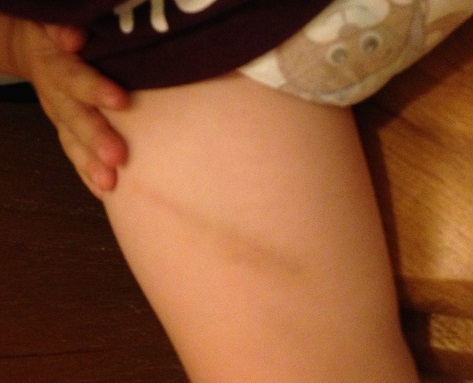 That scares me as much as the physical violence my son and I have faced from her. 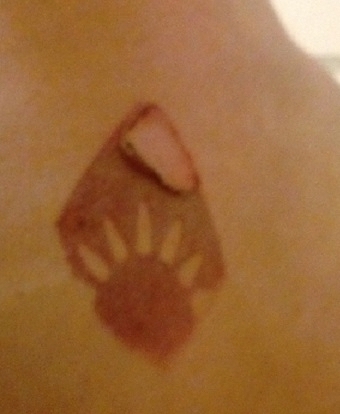 What do I tell my son when he sees the scar on my back from where my wife burned me with a hot iron while I slept? How do I erase the memories from his mind of me holding him in my arms and him squealing as his mother hit me, bit me, and kicked me? How do I keep a sincere face when telling my 2 year old son that it will be ok (even though I am not sure it will be) when he is crying and begging to stay with daddy and not to go to mommy nearly every time he goes from me to her? She actually snaps at Michael and gets mad at him for not wanting to leave daddy instead of consoling him. She even denies him medical care like when he was having allergic reactions and the cops had to be called on her because I took him to get medical attention when she didn't think he needed it so she showed up and demanded that they not check him out. Because it was such a common normal procedure that could help our son, you probably wouldn't believe that she didn’t want to get him tested if there was not a 911 recording of the incident when medical supervisor called the 911 on her. I don't hate her I pray for her. Baby Michael needs both a mom and a dad, but she needs help and is not capable of making even reasonably good decisions for him. She isn’t intending to do harm, but she does because she cannot understand, or refuses to understand what is right and wrong. She has been diagnosed with Generalized Anxiety Disorder which contributes to her rash, sometimes violent decisions and she needs help. She won’t get help though and instead she filed for divorce and is trying to keep my son from me. My son is in danger from her bad decisions and violence and I need help protecting him because I have run out of resources. Even with the mountain of evidence showing she has abused and neglected me and my son, including her own admissions in testimony, I still face an uphill battle in custody simply because I am a guy. I have spent way more than I can afford in legal fees and I have nowhere else to borrow from. But I will stop at nothing (and cannot give up for Michael’s sake) to what I truly feel I need to do to keep my baby boy safe. So I am reaching out to friends and family who might feel led to help. At the very least, you all can keep us in your prayers. If you can give even a small amount though, please do so, and spread the word to any friends or family who might be interested in helping. I ask though that you not post this publicly and that you prayerfully consider who you share this page with - only sharing with those you really think might help (prayerfully or financially). I am trying to share our story to relay a need and request prayer, while still trying to be as sensitive as possible to those involved, including my wife. I do still care about her and her family so I do not wish to humiliate her or anyone else. Thanks. My wife, Courtney, would leave my precious one year old alone in cars in parking lots in Beaumont, TX while she was having an affair with another man, Lamar, in a different vehicle. She is physically abusive with me and my son. 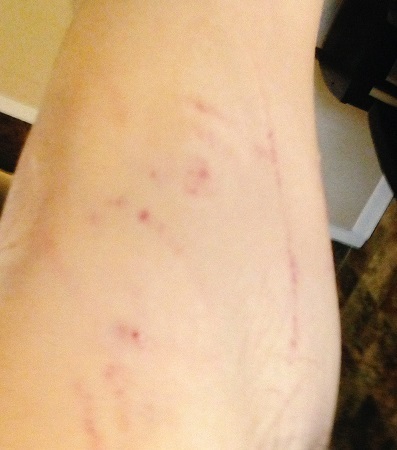 She not only scratches and bruises me, but she even burned me on the back while I slept. She has been diagnosed with a psychological disorder which was apparent to the counselor in the couple of times I have been able to get her to go talk to a professional. I do not believe she intentionally wants to hurt Michael, but she just cannot grasp the consequences of her actions and how it hurts her son. She puts her desires over his own safety and doesn't believe it is wrong. If you passed her on the street in public you would never know that she was even capable of the things she has done and has admitted in testimony to doing. She needs help. She has denied him medical care and even had the cops called on her when she tried to keep me from taking him to a potential life-saving medical exam. He cries for daddy and says no mommy nearly every time he leaves me to go to her. Unfortunately, the list goes on. I do not believe in divorce and I begged her to get help for Michael's sake and as a Christian to keep the marriage together. She refused to get help and filed for divorce and tries to keep Michael from me. Now, I am fighting for literally my son's life in a custody battle. That is just a quick overview of what is going on. Below is more detailed information. Please, if you can help out do it and discreetly share this with others who might could help. My son needs to be protected and even with a mountain of proof showing abuse and neglect done to me and my son, and even with state law that is supposed to prohibit those who have a history of child neglect and domestic violence (like Courtney) from getting custody, it is still an uphill, expensive battle for me because I am a guy. Most people settle and don't fight because of the cost and toll it takes. I don't care if I have nothing in the end as long as I keep my son safe. Material things of this world are not important. In the limited times I have been able to get her to seek professional help, she was diagnosed with Generalized Anxiety Disorder and I know it is much more than that. I don't hate her and I want Michael to equally see his mother and father, she just needs help and is a danger to her own son and has a hard time comprehending right from wrong, like her not thinking it is wrong to leave a one year old baby in a car in a parking lot. There have been two occasions where Courtney got upset and got in her car with Michael. The first time, she crashed into the garage, and on another occasion, into my brother's car. She was so worried about me seeing her iPad (which had messages to/from Lamar) when I got home that as soon as I pulled up she ran inside to get her iPad and left one year old Michael alone in the street! Baby Michael would get an allergic reaction that seemed to get progressively worse. His stomach would hurt and he would get painful looking red rash around his mouth, congestion, and puffy eyes. I recognized the signs of an allergic reaction from my army training as a combat medic and EMT so I told his mother on numerous occasions that I wanted to take Michael to go get an allergy test before it gets worse. She refused to agree with me and said nothing was wrong and he didn’t need medical attention. I took him anyways knowing that he could die from a severe reaction. She showed up and demanded that they not give Michael the allergy test. 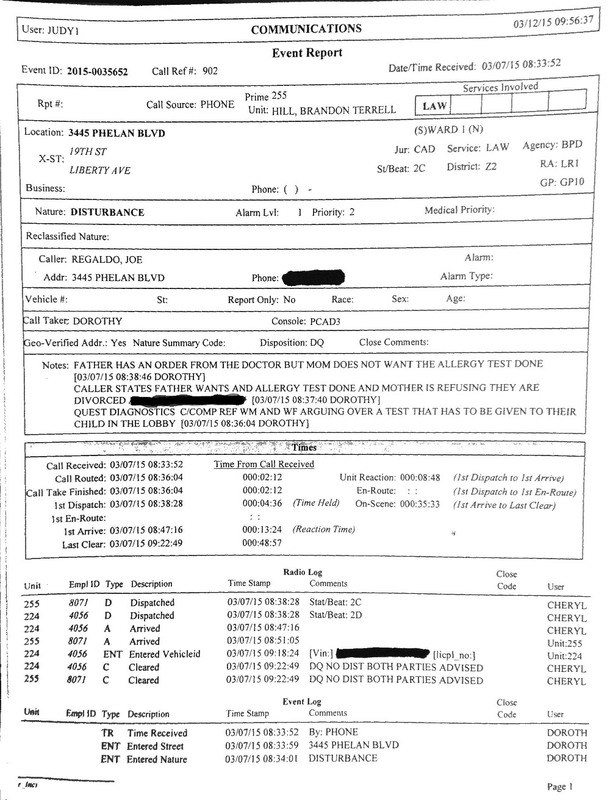 They had to call 911 on her and have the police come over because she was causing a scene and was telling the staff that she was not going to let them give Michael a quick and simple blood draw to test for allergies. I had a Doctor’s order and I am the father so I got him allergy tested. Come to find out, he is highly allergic to cow's milk. We would have kept giving him milk had we not found out and he might have had a really bad reaction one day. Physical Abuse - Domestic ViolenceUnfortunately, that is all just a small glimpse of what has been going on all of these years. 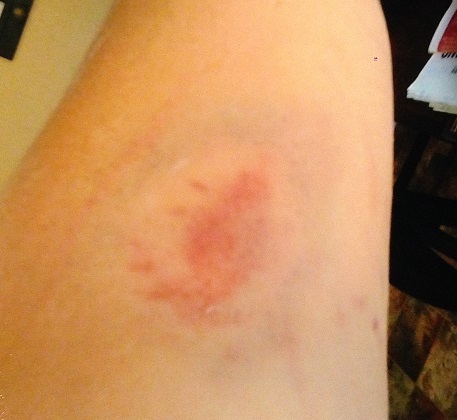 Not long after we got married, my wife started getting physically violent. The violence got worse over time and it wasn’t long before I was having to wear long sleeve shirts to cover the bloody scrapes and bruises. One night I woke up to her burning me on the back with a hot iron. Can you realize the pain and embarrassment I felt when I had to, for instance, joke at work that my wife gave me a hickey on my neck to cover for the fact that she had hit me and scratched me on my head and neck the night before? She was starting to hurt Michael too because her blows would sometimes hit little Michael too as I held him to protect him from her. Her frustration started to be directed towards him too. When Michael wasn’t even one year old she would spank him for not eating with a fork and yank down his arm to pick up a ball when he didn't even understand what she wanted him to do. At only six months old, she would get on to him and tell him “No” very harshly just for whimpering – something every baby does. Emotional TraumaNeedless to say, Michael is traumatized from all of this. He wants both a mommy and daddy and doesn’t understand what is going on. He is terrified anytime I even leave the room. Not that he doesn’t love his mommy and not that he doesn’t have fun with her, but when it is time to exchange Michael, Michael knowns who is safe and more loving and wants to stay with me. He has never once cried leaving his mother to go to me. Little Michael cries for daddy nearly every time he has to leave me and he even cries and says no mommy right to her face. Instead of consoling him, she chastises him for saying no mommy. When I have him for extended times, I let him call his mommy if he wants or if she wants. When she has him she refuses to let him talk to me even though it would soothe and comfort him. I let her talk to Michael though when I have him anytime she asks and I have even offered it to her myself, but yet, she doesn't let Michael call me or me call Michael. She even admitted in her testimony that when she has him, she ignores my phone calls when I am just trying to call and talk to my son because I know it would help him since he misses me and is too young to understand what is going on. But she doesn’t think he needs to talk to his daddy so for the past year and a half, I have not been able to talk to my son on the phone when she has him to tell him goodnight or that I miss him or anything else a father should be able to say to his son. Even during the marriage she would do everything she could to keep him away from me. I still have the messages that I would have to send to her and her best friend, Mary, begging them to stop taking Michael and running around and asking with them to let me be with my son and that I would even come to them. Who has to plead to their wife's best friend to please tell them where they are eating lunch with his son after church so he can join them after working an overnight shift? It was actually Mary who introduced Courtney to the Lamar and even invited them to her house together (without me) after it was clear they were having an affair. Courtney would not just run around to keep me from my son. Even in my own home, she would get violent even if I just wanted to pick up my son and hold him. She didn’t want me to be able to have anything to do with him. She locked him in the bedroom at night with her for over a year never letting me have the joy of snuggling with my son while putting him to bed. My wife and I might be separate, but Michael isn't separate from his mother and father and he needs both to be able to help him through this difficult transition. He should be able to rest assured and feel secure that he still has a mother and father no matter who has “possession” of him that day. It should be Michael's needs above our desires, but Courtney refuses to do that. Reached out for two years to our Pastor, Counselor and her parents for helpFor two straight years during the end of our marriage (which was also practically the beginning since we had only been married for a relatively short time before then), I reached out to her parents, our pastor, counselors, and begged for help, telling them specifically that she was beating me up, sending some of them pictures of my bruises and scratches and pleading for help. Could I have easily hit her back? Sure. But I didn't because I don't think it is ever right for a man to hit a woman. Also, I still wanted it to work out because I believe in marriage. I believe in “for better or for worse” and I really believed that if we went to pastors and counseling and to her parents that they would persuade her to get help and things would get better. I was wrong. She didn't want help and a few of the people I reached out to didn’t seem to want to help. They seemed to just want to make excuses for her behavior with some in her family even going as far as telling my family that I didn’t try hard enough or didn’t love her enough. I am sorry but there is no excuse for leaving your child in a car to have affairs, for burning someone with a hot iron while they sleep, and for trying to keep a son away from his loving and caring father. There were some who I believe wanted to help like our Pastor at First Baptist Beaumont, Chris Moody, who did meet with us several times. But I don’t think he was even sure how to help because he said that she has hate in her eyes more than he has seen in anyone else and he doesn’t understand it. Many others don’t understand it as well, because there is no reasonable explanation. It is an irrational unprovoked hatred. A hatred that has put her own son at risk and will continue to unless she receives the help she needs. Our pastor also said if she doesn’t get help the violence will just continue onto her next man. Even the psychologist we went and saw made the same comment to me that Michael could get hurt, even with my wife not beating up on me anymore, because little Michael will still be in the middle if his mother gets violent with future boyfriends or with him; especially since my wife didn’t just start getting violent with me. She has a history of getting upset and lashing out at her family, friends, and previous boyfriends. Even though our pastor wanted to help, I feel like everywhere I turned (even to good people I still respect like my pastor), it did not seem like Michael and I got the support that we needed – the help that I feel a woman who was in an abusive relationship would have gotten. This may have been partly due to the fact that I am a man in a domestic violence situation which is less common, and partly because many I reached out to were her own friends and family (hoping they could intervene) so they just didn’t want to believe that their loved one would do such horrible things. Courtney is very sweet to others and appears innocent to the outside world (which is one reason I fell in love with her myself) so I can see how it would be unbelievable. I was even in denial myself when it first started happening. Now though, we have her own testimony admitting to many of these acts of abuse and neglect. Otherwise, it is hard to believe. Suspected child neglect and domestic violence should always be taken seriously though especially by the church where Courtney worked (and still works) in childcare. And it was my understanding that Mark Adams, the Executive Pastor, was going to look into it since he is the one who deals with employees. But I do not know if it was ever fully investigated because I was never approached about the situation. Whatever the reason, the extent of everything is now known and there obviously was not an adequate and appropriate response to suspected child neglect and spousal abuse by one of the church’s childcare workers. Please know that I do not think my church leaders are bad and I love my church so I am not trying to paint them or anyone else in a bad light. It happened the way it happened though and I am simply trying to share my story in its entirety. This is in order for you to fully understand the situation and how it brought me to where I am now – a father who is now reaching out to you because over the several years, he has exhausted all of his resources for help (even from those in position to really make a difference). Before my wife left me, I finally convinced her to go to Larry Walker, a board certified counselor, believing he would know how to help me and Michael with the violence and child neglect because he has a Christian Counseling center at the church. I was wrong again. He diagnosed my wife with an anxiety disorder, according to his notes, and he told her that CPS could have taken Michael if they would have found him in the car alone. But then this Christian marriage and family counselor referred her the name of Scott Browne, a divorce lawyer, and even gave her his number! That advice from a trusted source was all she needed to completely quit trying. After that, she retained that attorney and there has been no hope for reconciliation ever since. My family and I have tried to reach out to Courtney telling her that while we don’t agree with her behavior, we still love her and are here for her. But Scott, who is also a Christian and a member of the church as well, has threatened harassment against us for simply trying to reconcile to some degree for Michael’s sake. So now, we cannot contact her regarding anything but logistic about Michael. How can there be reconciliation though without communication? I do not understand why both of these Christian men have not promoted the gospel of reconciliation (even to some degree) in their professions and have actually encouraged division. Separating us doesn’t help Courtney with her ongoing problems and it certainly does not help little Michael. It only puts him in more danger because I have always been there to protect him. And not to mention, that if they truly cared about Michael’s well-being, they would at least be trying to help her with the issues. Come to find out, as a board certified counselor Larry was actually supposed to report the abuse and neglect (clearly documented in his notes) in order to protect Michael but he didn’t. 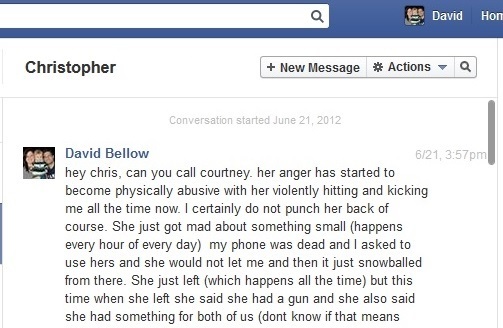 He did however accurately diagnose Courtney and even tried to bill insurance for “treatment” of the disorder. So long story short, counseling did not help for the many apparent reasons even though the problems (her disorder, abuse, and child neglect) were clearly seen. It is difficult though for counselors who are good friends with their clients to report child abuse. But this is exactly why laws against dual relationships exist...to protect the innocent and especially the children involved. Larry should have reported the abuse, and although I am not angry because I know God has a plan for everything, I am very disappointed and hurt because he seemingly looking the other way which has resulted in pain for my child this last year and a half that could have been prevented. Had Larry reported the abuse like the law said he was supposed to then Michael would have been spared the last year and a half of physical and emotional abuse because Courtney would have been forced by Child Protective Services to get help instead of encouraged by a counselor to get an attorney who probably just sees her as a paying client. As you can see, seeking help with a pastor, parents and counselor didn’t get my anywhere for whatever reasons, so now I am now having to fight for my son in a very expensive custody battle. Hind sight is 20/20, so I do realize now that calling the police would have been the best thing to do but it is hard to call the cops on a loved one when you still want to save your still fairly new marriage. I did seek help though in places that I believed I would get help like pastors and counselors (and it is documented thankfully), but I should have just called the police myself. I guess when you love someone you just want it to work out, don’t realize the severity of it, don’t want to embarrass the spouse you still love by calling the authorities, think maybe their actions are somehow your fault, and ultimately, hope they will get better. Before I was married I never understood why battered spouses did not just call the police. Well I understand it now. In some ways, it may be harder for guys to seek help because, well, we are guys and are tough and can handle the abuse, right? Male or female, it doesn't matter, abuse against either gender is wrong and is very damaging, mentally and physically, to not only the spouse but their children as well. The truth is, according to the facts presented and her own admissions, that she has left Michael in cars, denied him medical treatment, and has gotten physically violent. She needs help and I have to win custody (decision making) of my son in order to protect him. Not that I want to keep my son away from his mother because I don’t. Michael needs both a mother and a father and needs to see them both equally. His mother just cannot make good decisions for him and Michael is in very real danger of getting abused or neglected again. She needs help especially because of her disorder but since she refuses it then, I have no choice but to now let a jury decide custody. That is why I have to fight for custody (decision making rights) in court because it is what is best for Michael. I do not want to go to trial as I know it will be very embarrassing for not only Courtney but many others involved as well. I wish she and her attorney would have accepted my many fair and reasonable offers to settle (giving Courtney equal time with our son, supervised while she gets treatment for Michaels safety, and offering Courtney more than 50/50 of the community property) but they still refuse to accept anything that allows Michael to be with his father half of the time, so it goes to a Jury of 12 in the middle of November to decide the fate of my son. Please be in prayer because I know God can do anything between now and then. I am absolutely the best provider for Michael and there is more than enough evidence proving that Michael and I are and have been hurt by my wife, but I am still at a disadvantage because I am a guy and she is a girl. Even though the Supreme Court has said that a judge cannot include gender in their reasons for granting custody, everyone knows that it still happens all too often even when the father is the best provider for their child. I didn't want this and I do not even believe in divorce. But it is happening whether I like it or not and I have to protect my son. I need help to do that though. Please help, pray, and spread the word to others who might support me (discreetly though, as it is not my intent to “smear” anyone involved). Thanks and God Bless.